A few years ago I walked into Dolce & Gabbana on the Rue de Rivoli in Paris wearing an old style pair of white and blue trainers that I used to walk everywhere in. Forget mesh, knit, flyknit, metallic - these, I shudder to remember, were heavy, inelegant and had never heard of chic. I've always been a Nike wearer and wrote recently about my Air Zoom Pegasus 35 trainers which I love for walking and take with me pretty much everywhere I travel. When I noticed that my Air Zoom Vomero 10's which I have in my gym bag were looking a little weary I decided to invest in the latest model, the Air Zoom Vomero 14. 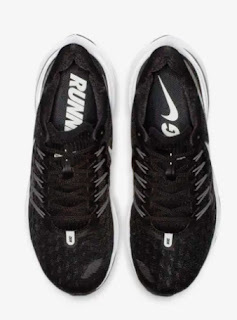 This trainer clocks in at about £120 which obviously isn't cheap, but when you're talking about comfort in the gym or if out for a run, let alone looking good, you need to make an investment which will support your feet and fill your needs totally. Having had foot problems a few years ago I know these things. In my case this means plenty (and I mean plenty, of cushioning) arch support, width at the front of the shoe and a trainer that looks good if you're out and about - think athleisure - as well as in the gym. These trainers are the perfect solution for anyone who wants a cushioned trainer which you can wear anywhere. I was able to walk a few miles in these the first time I put them on in total comfort. 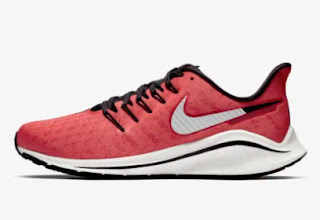 To me these feel lighter than the Pegasus 35 although they're supposed to weigh the same, they're certainly less bulky despite the look of the built up sole unit. My only complaint is the lack of the same colour choice of the Pegasus, although that may change, and there are more colours online in the US store than there are in the UK - but you can't really beat black and white, can you?